The Indigenous People of Biafra (IPOB) in recent time have gained more concern, influence, and recognition than earlier. This can be attributed to their resoluteness, steadfastness in their agitation for the restoration of Biafra. Recently, in Anambra state Biafra land, the position of IPOB was acknowledged as their agitation for the restoration of Biafra was greeted with numerous successes. Anambra State under the authority of Gov. Willie Obiano has always been one of the most unconducive and scandalous environment for the IPOB family where the order to massacre IPOB members is given out at will just to please tyrant Muhammadu Buhari whose only intention is to wipe out all the IPOB members, due to the fact that IPOB seems to pose a big threat to his rogue APC led administration. The proactive measure taken by IPOB to quell this horrendous situation, the Indigenous people of Biafra are experiencing in the hands of the zoo government, surfaced in a gallant style recently in the state. Recall that Obiano’s men stormed one of the markets within the Niger bridge head axis known as “OGBOGWU” on the 5th day of April 2017 when the traders normally have their general weekly prayer session. The traders were happily praying until when the announcement of Obiano's representatives was made and there was a violent outburst. People grew annoyed and started jeering at them, chanting songs of war and of sorrow. 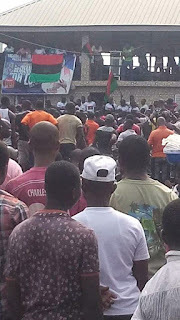 Each person was holding a BIAFRA flag in their hands and they were vigorously waving them in the air as they chant those heart touching songs. And it looked as if it was something well planned. 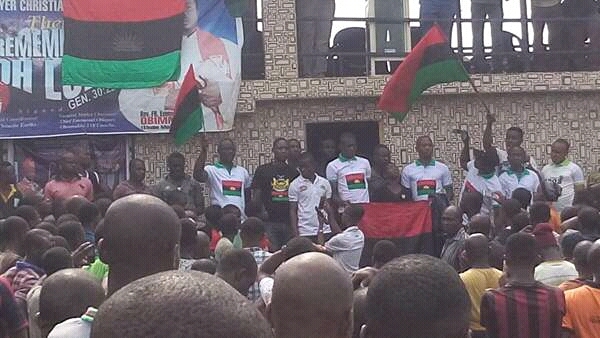 The traders, in their highest level of their voices were shouting "No Biafra No Peace!" This however disrupted the intention of Obiano’s men for being present at the gathering and gave them a premature and shameful exit. 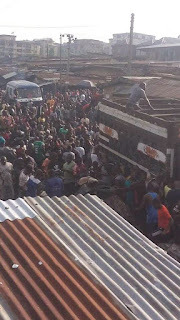 Again On the 7th day of April 2017 at Old Motor Spare Parts Market known as Mgbuka Obosi which situated along Onitsha/Owerri road, IPOB had recorded another glorified episode of bravery by its members within. Our news men had gathered that the trade center normally held their general weekly prayer session every Friday. A new different program, on this day was featured. 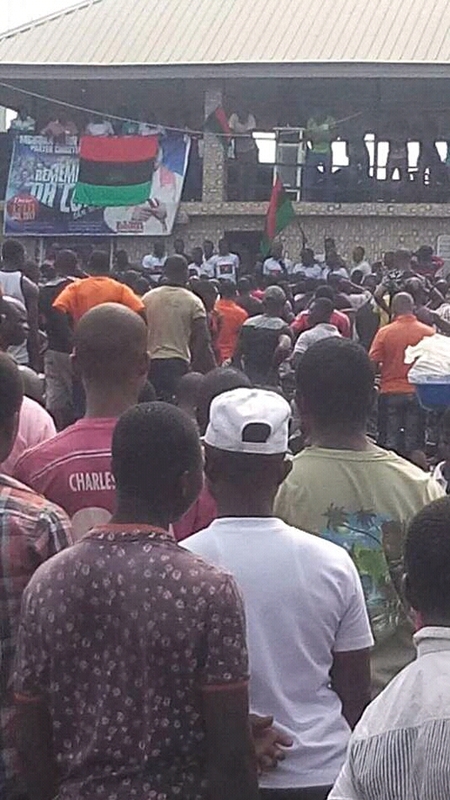 The IPOB Family, “OKU-UMUCHIUKWU ZONE” which covers the Mgbuka obosi and Awada axis had entered the praying arena and requested for an audience to address the masses as regards to Biafra issues. The chairman of Old motor spare parts dealers Mr. Emmanuel popularly known as DEGOGO whole heartedly gave a nod to the request. The P.R.O introduced the presence of OKU-UMUCHIUKWU ZONE and the zonal coordinator, who was smartly dressed in IPOB uniform was able to publicize the 30th may Sit At Home exercise without any interruption. He also enjoined the masses to join in the struggle for the restoration of our lovely nation (BIAFRA) which is the only remedy to the tragedies prevalent in our society today. The OKU-UMUCHIUKWU zone after the address then had a mini peaceful rally of evangelism in the market before everybody now went about their various businesses. Another incident which took place that depicts IPOB unquenchable desire for the restoration of Biafra was when Gov. Obiano declared 8th and 9th of May 2017 public holidays. His reason for the holidays as people were made to understand was for everybody to go and obtain his/her voters card at any nearest polling station. He had ordered for the total shut down of schools, markets, banks etc because of this very issue. Not minding his position as the number one citizen of the state, governor Obiano’s instructions were completely neglected as traders, some private schools; offices were busy carrying out their normal activities. Some people were even heard saying that who so ever that desired for voters card should go on his or her own volition and get it for such exercise would never mar their daily programs. To get more information and to expand our research based on this same issue, our eagle eyed news men, led by mazi Eziwetalu Peter and Mazi Ikenna Ozulumba Mbaegbu of “Umuchiukwu Writers” later visited the Ogbaru main market known as Relief market. It was obvious from our findings that all the market square at Onitsha axis which included the bridge head market, old motor spare parts market, and even Onitsha main market never observed this egocentric order given by the drunk governor, as people were busy going about their normal businesses as if nothing was said at all. Those are the highest recognitions that IPOB in recent time, had received in Anambra state as both traders and their leaders had publicly shown their full support in the struggle for the restoration of Biafra and as well never failed to register their displeasure over Gov. Willie Obiano’s governance and his total disapproval of IPOB activities in the state. It will be nice if other states in Biafra land emulate this kind of resoluteness and steadfastness shown by the Anambra state chapter of IPOB. This will in its entirety fast forward the agitation for the restoration of Biafra and allow us to easily get what we having been clamoring for – Our absolute independence. The right to agitate for our freedom is our indigenous right under UN charter. And we must have our freedom whether good or bad. The British government in collaboration with the zoo government is struggling very hard to deprive us of this right due to the proceeds of our land which they have continued to enjoy. However, our people have a saying that “One who because of his tallness decides to punish a child by raising up his playing object out of the child’s reach must surely bring it down when the hand with which he holds the object begins to pain him.” Not only that Biafra restoration is a divine project sanctioned by Chiukwu-Okike-Abiama, it is equally our indigenous right and our freedom must be given to us when the time is right.